The Mint Security team was recenlty contacted by HTC Wolffkran following issues on a worksite in Sheffield. HTC were suffering from repeated intrusions onto their site, with thieves targeting armoured crane cabling after gaining access through a perimeter fence. These thefts were costing the company a great deal of money and holding up vital work, so HTC Wolffkran needed a solution. 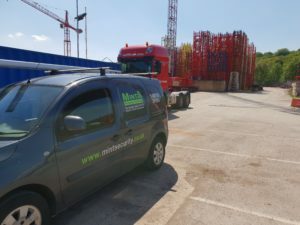 Working on a large-scale site just off the M1 in Sheffield, HTC Wolffkran had multiple cranes on-site and had been experiencing a string of break-ins. The primary target of these incursions was expensive armoured cables which was repeatedly removed from the firm’s cranes. The thefts created a costly, problem not just because these armoured cables are very valuable – hence their targeting – but because the loss of the cable was having a negative impact on the progress of the project. There is dedicated security in-situ, but with such a large space to cover, additional security measures were needed to more effectively safeguard the heavy plant and expensive equipment. That’s where we came in. Speaking to site management, we worked together to design a system that would provide total site coverage – day and night. As we always do, the Mint Security team worked closely with the client to understand their site, its vulnerabilities and use patterns. We then recommended suitable camera options, optimal CCTV placement and additional security features to make the site as safe as possible. The result of this planning was an interconnected system of ten full HD speed dome CCTV cameras, with a constant connection to the on-site security lodge. Now, in crystal clear HD quality, the security staff can fully control and move the cameras on demand for full 360-degree site coverage. This enables security to keep a very close eye on all parts of the site, paying particular attention to the perimeter fences thieves were using to gain access. Because the site needs particular protection and vigilance during the night time hours, we installed cameras with clear night vision. This cutting-edge technology now gives the Sheffield site security staff a 150-metre night vision CCTV view over the entire site. The security staff and management now have the tools they need to not only see the intruders onto their site but also to pinpoint where they are at any given time. This means a safer worksite, vastly improved security and enormous savings for HTC Wollfkran – and the project can move ahead smoothly once again.